Longtime councilman William McKoy took the last five minutes of his time at the City Hall debate on Monday afternoon to lay into Andre Sayegh. He argued the Democratic Party that overtly backed Sayegh four years ago is working covertly to get him elected. McKoy’s campaign has recycled the tag line – “Paterson is not for sale” — from four years ago. It has failed to resonate with voters as well as when it was used by former mayoral candidates David Gilmore and Lydia Robles. “It’s the same fingerprint of the elites trying to determine Paterson’s destiny,” said McKoy (pictured), who has been on the council for 18 years. McKoy sees the numerous endorsements received by Sayegh as outside groups attempting to secure influence in the Silk City. He has also criticized Sayegh for stressing his connection with the likes of governor Phil Murphy and congressman Bill Pascrell. Sayegh was one of Murphy’s very early backers in Passaic County. He sees his connection with the governor a positive to get more resources to spur economic growth and provide for better public safety in the city. “We’re not selecting someone based on relationship. If your relationship is giving you the benefits, that’s the definition of corruption,” said McKoy. Sayegh largely ignored McKoy in the debate. He focused his fire on Mendez. 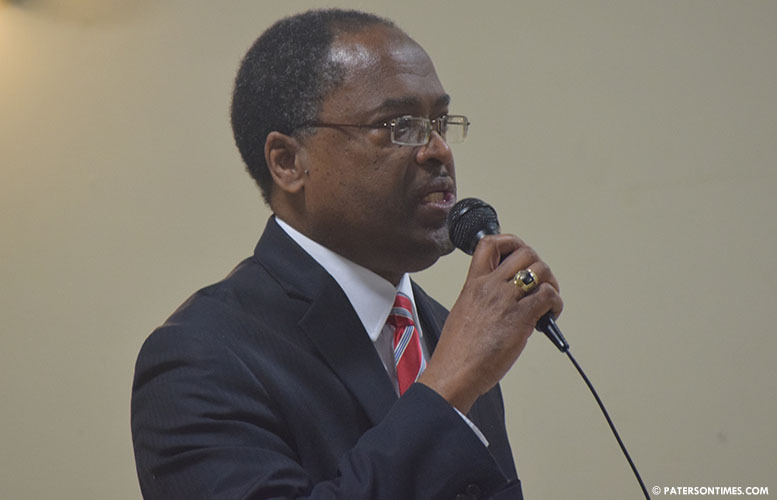 He briefly engaged McKoy when the longtime councilman asked him of the consequences that would follow if every member of the council voted against the budget. Sayegh slammed McKoy on his 15 budget votes to increase taxes. Sayegh at a previous forum said he will hire a capable business administrator to lead the municipal government. At the time, Sayegh said he will be a cheerleader for the city, while the business administrator handles operations. Earlier in the debate, former school board member Pedro Rodriguez attempted to set Sayegh at odds with state senator Nellie Pou, who serves as the city’s business administrator. Rodriguez asked if Sayegh will remove Pou from the business administrator’s post. “I’m going to make sure our business administrator is the most qualified individual we can find,” said Sayegh. He would not say whether Pou would be removed. Pou was appointed by Torres. She has remained at the post under the temporary administration of Jane Williams-Warren. She will likely be replaced by someone else when a new administration takes office on July 1. McKoy described Sayegh as a “novice.” Sayegh has been on the council for almost 10 years and McKoy almost 20. Both men are administrators: Sayegh, director of job readiness and customized training at the Passaic County Community College (PCCC), and McKoy, chief auditor at the early childhood department of the Jersey City School District. Nellie Pou receives three government paychecks for do nothing jobs and will receive three pensions when she "retires" from those do nothing jobs. That's NJ for you. YUP YOU GUYS HAVE DONE WONDERFUL BY YOURSELVES, KEEP UP WITH THE GHETTO MENTALITY MORONS. SAYEGH AT LEAST UNDERSTANDS PATERSON NEEDS OUTSIDE HELP TO BUILD IT SELF UP. MAKE POWERFUL FRIENDS WHO WILL HELP IN THE DEVELOPMENT OF THE TOWN. STOP WITH THE WE CAN DO IT BY OURSELVES THING IT DOESN'T WORK. MCKOY IS A RACIST MORON.